An overview of the NYC real estate taxes you’ll have to face when buying, selling or simply maintaining a property in New York City. Read this guide before buying, whether it’s your first or your tenth home purchase! Updated for the Tax Cuts and Jobs Act slated to take effect on January 1, 2018! Why Are NYC Real Estate Taxes so High? How can you avoid the Mortgage Recording Tax in NYC? How Does the Tax Cuts and Jobs Act Affect New Yorkers and NYC Real Estate Taxes? The total tax burden for primary residence home owners in New York City can be excruciatingly high after you add in income taxes, sales taxes and other miscellaneous taxes unique to New York. However, property taxes by themselves in NYC are surprisingly lower than both the New York State average and the property tax rates of surrounding states like New Jersey. According to SmartAsset, New York County’s average property tax rate is only 0.72% vs 1.5% for New York State. That’s still high compared to Hawaii, which charges only 0.27% property tax on average according to a recent study by WalletHub. The reason that New York can afford to charge less for traditional property taxes is because of the many other revenue sources available such as the high income taxes charged by both the city and state governments. Because income taxes hit both renters and home owners alike, property owners in NYC take a smaller burden of the total taxes paid vs other counties and states. Furthermore, New York’s finances are helped by sales tax income from a booming tourist industry, taxes on various industries and higher taxes on other property types such as commercial buildings. Moreover, NYC in unique in charging an income tax on pass through businesses such as LLCs and S-Corps called the Unincorporated Business Tax (UBT) which equates to a double taxation on the same income at the city level. Larger businesses structured as corporations can’t escape either, they face an even higher General Corporation Tax (GCT) by New York. These are just some of the things to consider before you buy an apartment in NYC. Pro Tip: It can be quite beneficial from a tax perspective to live in New York City if you are a property owner with low income but a high level of assets. High income taxes on individuals and businesses offset lower taxes on properties in NYC. As a result, it’s great to be in the city if you have wealth, don’t need to work, and don’t generate much active taxable income! One of the largest closing costs for home purchasers in NYC consists of the Mortgage Recording Tax. This tax only applies to purchasers of real property, which means co-op apartment buyers are luckily excluded. This tax is levied only on the mortgage loan amount, not the purchase price. Learn everything you need to know about the Mortgage Recording Tax in our latest article, and learn how you can reduce it with a purchase CEMA mortgage in NYC. You can partially avoid the Mortgage Recording Tax through a Consolidation, Extension and Modification Agreement, otherwise known as a CEMA loan. In a CEMA loan for a purchase, the seller’s bank will assign the seller’s mortgage to the buyer’s bank. This means the buyer will only have to pay Mortgage Recording Tax on any fresh loan amount he or she borrows in excess of the seller’s remaining mortgage principal. For example, say that the buyer wants to take out a $1 million mortgage for the purchase and the seller’s remaining mortgage balance is $800,000. In this case, the seller’s $800,000 mortgage is assigned to the buyer’s bank and consolidated with a new mortgage of $200,000. Because only the $200,000 is a new mortgage, the buyer will only have to pay mortgage recording tax on the new $200,000 loan. While most banks will not have an issue with a CEMA loan for refinancing’s, especially if they are on both sides of the transaction, many banks will not be comfortable doing a CEMA loan for a purchase. Check with one of our seasoned real estate brokers for advice on which NYC mortgage lenders are best for executing a purchase CEMA. Note: The lender also pays a tax of 0.25% of the loan amount. In commercial deals, lenders will often try to make the borrower absorb this cost. It’s very important to understand that the law specifies “consideration” versus price. The total consideration can be very different from the contract price. Total consideration takes into account any closing costs that the buyer paid on behalf of the seller. This is very commonplace in new development sales where the sponsor attempts to have the buyer pay for the sponsor’s transfer taxes and attorney fees. You need to be careful as these extra payments will add to your total consideration, and a deal that you thought was just under the Mansion Tax threshold might actually be over the threshold. Depending on how the transfer of the superintendent’s living quarters is structured, a buyer’s total consideration can go up by the amount they contributed for the extra apartment. Make sure you talk to one of our veteran real estate brokers who can help guide you through the purchase process, especially if you are on the borderline of having to pay the Mansion Tax. There are too many novice real estate agents who will lead you to believe that you’ll always be able to avoid the Mansion Tax by having your contact price be even one dollar short of $1 million! Note: If you purchase a multi-family property with 4 legal units, you can avoid the Mansion Tax. However, you will be subject to a higher Mortgage Recording Tax if your loan amount is greater than $500,000. Sales Tax – This is a minor, recent development. Sales tax is now being regularly applied on the cost of the title search. Tax Escrows – An experienced real estate attorney will explain this to you in detail, and include all the money you’ll need to put in escrow for property taxes in a detailed closing costs statement for you before closing day. Don’t be shocked when you see the amount you’ll need to set aside in escrow for taxes as this amount can vary dramatically depending on your closing date. Keep in mind that NYC’s fiscal year starts on July 1, so a seller will pay the remainder of quarter’s property taxes and you will owe a credit to the seller on the closing statement. Furthermore, your lender will typically require you to hold 3 to 4 months of property taxes in escrow, as well as home insurance. 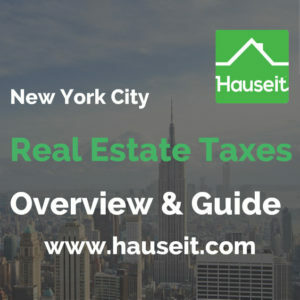 One of the most onerous NYC real estate taxes you’ll have to pay as a seller are the dreaded NYC and NY State transfer taxes which we discuss in detail in a separate article. In summary, the transfer taxes New Yorkers will have to face consist of the following. Note: If you sell within a 12 month time frame 2 or more residential units in the same building, NYC will view it as a commercial transaction and tax it at the higher transfer tax rate for commercial transactions. If this is an issue you have, please contact one of our seasoned real estate attorneys who have had success with appealing this. It is indeed possible to appeal this higher rate if you can demonstrate for example that the two units are truly one combined apartment. This may be a crucial consideration for owners who have combined apartments but have not legally combined them (i.e. they still receive two separate property tax bills and the city views them as two separate units). One of the most hated NYC real estate taxes is the Flip Tax, which is most often imposed by co-op boards on sellers. This is a private tax that can vary, but is typically 1 to 3% of the sale price. The proceeds go into the building’s reserve fund. Some buildings do not care who actually pays the flip tax, in which case the flip tax can be a negotiating point and the seller may be able to coax the buyer into paying it instead. Note: We are seeing more and more language in the offering plans of new construction condos that allow for the possibility of a flip tax to be imposed. This is alarming and new for condo buyers. Condos typically do not have this tax, and for an older condo building to impose a tax, typically a three quarters vote of the owners would need to be secured before it can be imposed. Federal and State – it’s important to note that NY State’s income tax covers capital gains. Please read our article on buying property as a foreigner in NYC to learn more about capital gains taxes that foreigners and American nationals have to face alike. Long-term versus Short-term – No doubt you’ve heard from your stockbroker that long-term holdings are taxed at lower rates versus short-term holdings when you sell. The threshold is one year. Please read our article on buying property as a foreigner in NYC referenced above to learn more about capital gains taxes that foreigners and American nationals have to face alike. FIRPTA is a mandatory tax withholding on sales of US property by foreign owners. The reason this tax exists is to prevent foreign sellers from taking the proceeds and running, and not worrying about paying their share of taxes come April 15th because they have no substantial remaining ties in the US. As a result, buyers are required to enforce FIRPTA withholding, which amounted to 10% of the sale price before February 2016. Since then, FIRPTA withholding has been amended to 10% if the sale price is under $1 million, but 15% if the sale price is over $1 million. Please read our article on buying property as a foreigner in NYC to learn more about FIRPTA tax withholding that foreigners have to face when selling property in the US. NYC real estate taxes are mitigated by the fact that primary residence sales are covered by IRC Section 121 with a $250,000 exemption for single filers, and a $500,000 exemption for married filers. An important requirement you must fulfill to be eligible for this exemption is that this residence must have been your primary residence for at least 2 out of the last 5 years. The 2 years of primary residency does not need to be consecutive. Furthermore, there is no requirement for you to purchase a replacement property to take advantage of this exemption. For example, say you moved to an apartment in NYC a year and a half ago from your Westchester mansion which you’ve lived your entire life. If you wish to sell your Westchester home and to take advantage of this exemption, you must sell within the next half year. Otherwise you will either have to change primary residences and move back to Westchester, or you will not be eligible for the exemption. This tax exemption is the reason why so many co-op buildings have sublet policies that only allow shareholders to sublet their apartments a maximum of 3 out of 5 years. It’s to make sure that they can take advantage of this tax exemption! Legislative Update: there are no changes to this much loved tax exemption as a result of the recently passed Tax Cuts and Jobs Act. Though Congress had debated limiting this principal residence capital gains tax exclusion (i.e. proposals such as changing the primary residency requirement to 5 out of the last 8 years), it was ultimately scrapped much to the relief of home owners nationwide. Note: While there are no tax shelters for the sale of second homes, you are free to change your primary residence and take advantage of this tax exemption. Before the wide sweeping tax reforms of 1986, real estate used to be the ultimate tax shelter for just about every high income individual. The tax laws before 1986 allowed accelerated depreciation via ACRS and an unlimited deduction of losses against other active income. As a result, dentists and lawyers were purchasing real estate and investing in real estate partnerships en masse to reduce their income tax liability. The tax reform of 1986 changed all of that. Depreciation went from ACRS to straight line depreciation, meaning residential real property would start being fully depreciated over 27.5 years in equal increments. Furthermore, the ability to marry your real estate losses against your other active income was capped at $25,000 for non real estate professionals. However, those individuals who could prove that they qualified as real estate professionals could still deduct an unlimited amount of real estate losses against their other active income. Note: Licensed real estate agents automatically qualify as “real estate professionals” under the tax code and do not need to be professional landlords in order to merge an unlimited amount of losses from rental properties with their other active income. Even if a couple is filing taxes jointly and only one of them qualifies as a real estate professional, the losses from rental properties can be applied to their combined taxable income. Expenses and Depreciation – Deductible expenses for investment properties include mortgage interest, maintenance costs, repair costs, handyman costs and any other reasonable expenses associated with operating a rental property. As we mentioned before, you can fully depreciate the value of a residential property (excluding the appraised value of the land) over 27.5 years. That means you can depreciate an additional 3.64% of the appraised building value every year even though it is a paper loss versus an actual loss. Note: While you can depreciate the value of the building, you cannot depreciate the value of land according to the IRS. With that said, condos are generally viewed as owning zero land even if the collective group of all condo owners in a building does indeed fully own the land. A popular method to defer capital gains taxes is through Section 1031 “Like-Kind Exchanges,” commonly referred to as 1031 Exchanges. Typically, most owners will sell their current property before purchasing a new one in a 1031 Exchange; however, it is possible to also do the reverse and first buy a new property and then sell your old property. The key is to complete your 1031 Exchange within the IRS stated timeframes. 45 days to identify target property or properties from the date that you close the sale of your previous property. You must formally state the property address you wish to buy. It can be multiple addresses. 180 days to close title on your new property starting from the date that you closed the sale of your previous property. The 180 days time limit is inclusive of the 45 days you are allowed to identify your target properties. It is important to note that you can only defer all of your capital gains if you purchase a property of “equal or greater value.” If you swap for a less expensive property than the one you just sold, you will owe taxes on the difference. In other words, a partial deferral is possible. What does like kind mean? Fortunately for real estate investors, the IRS considers all real estate to be like kind. That means you can swap a farm for a commercial building and both are considered like kind! Legislative Update: The 1031 like-kind exchange is effectively unchanged for real estate investors as a result of the Tax Cuts and Jobs Act. Only one very specific category of investor, the speculative “home flipper” who never actually rents out the property, is now excluded from doing 1031 tax deferred exchanges. Furthermore, this type of tax deferred exchange will no longer be possible for other types of property beginning in 2018 (i.e. asset types outside of housing and real estate). Building Special Assessments – it’s interesting and important to note that apartment owners can add their pro rata share of most building assessments to their cost basis, especially when the assessment was levied for building upgrades or repairs. As a result, it’s very important to keep all letters from your building as proof, you never know when you’ll need it! Can a condominium or homeowners’ association borrow money? Typically the answer would have been no, versus a co-op where it’s very common for the co-op to have a mortgage on the entire building. However, with today’s loosening financial standards, more and more banks have become willing to lend to condominium associations based on the condo board’s ability to levy and increase common charges. Certainly a troubling trend for many condo owners to consider. 421-a Tax Abatement – as of 2017, this is a currently expired but very popular tax abatement meant to encourage the development of underutilized land, with the caveat that development cannot occur on park land. This tax abatement holds back additional tax on the improvements, but still taxes the original structure. The “core zone,” as defined by the New York City government, only receives a 10 year tax abatement. This zone has constantly expanded as more areas become gentrified. However, developments that occur outside of the core zone can have tax abatements up to 25 years! Note: Even if your building has a 421-a Tax Abatement in place, you should not be complacent as the assessed value will continue to increase if you do not dispute it. If your assessed value continues to increase while you have your abatement in place and you do not fight it, you may be in for a big tax surprise when the abatement ends! The process of disputing the assessed value of your property is called Tax Certiorari and there are many real estate law firms that specialize in this field. Feel free to contact one of our experienced real estate brokers for recommendations! J-51 Tax Abatement – this is an abatement that existing buildings can apply for when they make capital improvements. For example, if you repair your elevator, you may be eligible. There will be many grey cases here where it’s not entirely clear whether the work done was simply maintenance, or a capital improvement. An experienced real estate adviser will be able to tell you whether combining a paint job with a kitchen upgrade will make the combined project a capital improvement versus maintenance. Star Abatement – this is a very popular tax abatement for primary residences in New York City that are not owned in a LLC. Keep in mind that this tax abatement can’t apply if you already have another tax abatement in place like the 421g. If you are eligible, this nifty abatement will reduce your tax bill by 17.5%! An individual can give away $14,000 in gifts to any individual of his or her choosing per year without incurring gift tax. That means a married couple can give up to $28,000 per year to someone, like each of their kids, under the annual gift tax exclusion amount. If a married couple wishes to gift more than that amount to their child, they can still do so up to their estate tax exemption of $5.49 million per person, or $10.98 million per married couple. They will not owe gift tax up to that amount, but they must file a Federal gift tax return (IRS Form 709) if they gave someone more than $14,000 during the year. Estate Tax – Please read our article about buying property as a foreigner in NYC to learn more about how the estate tax affects both US nationals and foreigners alike. Non-Resident Aliens generally only have a $60,000 estate tax exclusion. However, income taxes and inheritance taxes are addressed by separate tax treaties with each country. Factors that can affect tax treatment for non-resident aliens include their domicile vs tax residence, which persons and what property is subject to tax by each country upon transfer and which party bears the burden of the tax. Having a non-citizen spouse adds another layer of complexity to estate tax planning. The estate tax of a deceased spouse will depend on the citizenship of the surviving spouse. All jointly held property with a non-citizen spouse will automatically be assumed to be part of the gross estate of the deceased spouse who is a citizen. The only exception is if the executor of the estate can substantiate the contributions of the non-citizen spouse to the acquisition of the property. Furthermore, citizens with non-citizen spouses do not benefit from the same marital deductions. Also, the estate tax exemption is not portable among spouses if one of them is not a citizen. Please take special note that New York is one of the few states that has its own estate tax. Furthermore, New York’s estate tax is more onerous in that if your estate exceeds the exclusion amount even by one dollar, the entire estate is taxed! New York is definitely not a friendly place to pass away! Legislative Update: The Estate and Gift Tax remain a part of the US tax code after the passage of the Tax Cuts and Jobs Act. However, exemptions have been doubled to $11,200,000 for individuals and $22,400,000 for married couples. Inheritors will continue to receive the benefit of a “step up” in cost basis of the assets included in a decedent’s estate to fair market value. The annual exclusion for the Gift Tax has risen to $15,000 per year, not because of tax reform, but because of an inflation adjustment. These changes will sunset for taxpayers who die after December 31, 2025. On January 1, 2026, the Estate and Gift Tax exemption will revert to roughly $5 million per person. This amount will be adjusted for inflation from 2011. If you are considering making making lifetime gifts since the federal exemption amounts sunset, you should consider whether the potential estate tax savings will outweigh losing the “step up” in basis of assets held to death. The Tax Cuts and Jobs Act directs regulations to be implemented which will protect against any additional exemptions used from being “clawed back” if a decedent passes away after the exemption sunsets. Please remember that many states such as New York1, Connecticut, or Pennsylvania assess their own estate taxes which will not be affected by federal tax reform. Taxpayers who live in states with a state estate tax may wish to consider making lifetime gifts before the increased, federal exemption amounts sunset. 1New York’s Estate Tax encompasses not just the federal gross estate, but also any “includible gifts” that were made in the three years preceding death. Gifts aren’t includible if they were made while the decedent was a non-resident, if the gift was made before April 1, 2014, or if the gift consists of real or tangible property located outside of New York State. In December of 2017, President Donald Trump signed into law the Tax Cuts and Jobs Act, the most sweeping tax reform since 1986. New Yorkers should understand that most of the provisions of the new tax law will sunset for individuals starting in 2026, while those affecting businesses are generally permanent. While most New Yorkers will see a tax decrease as a result of the Tax Cuts and Jobs Act, a significant minority will also see their taxes increase starting with the 2018 tax year. This minority will most likely consist of high income employees receiving a W-2, high income small business owners not eligible for the 20% deduction1 in “qualified business income,” and those with large personal residences and high property taxes. Deductions for state and local income taxes, as well as property taxes2, are now capped at $10,000. It’s interesting to note that New York does not allow for a deduction of federal taxes paid on New York’s tax return. As a result, the state and local tax (SALT) deduction limitation will really hurt some New Yorkers! Note: despite the widespread resentment of the SALT deduction limitation by New Yorkers, most accountants we’ve spoken with have told us that the limitation won’t affect most NYC home owners much because they were previously being hit by the Alternative Minimum Tax3 (AMT) which disallowed their SALT deductions anyway. That’s because Congress did not include a Cost of Living Adjustment (COLA) when they enacted the AMT in 1969. As a result, while only 155 households hit the AMT threshold of $120,700 for single filers and $160,900 for married filers in 1969, by 2015 the IRS states that 4.4 million Americans paid the AMT. Needless to say, if you are buying the average $2 million property in NYC, you would have been hit by the AMT under the old tax law and not been able to deduct SALT anyway! The new AMT income thresholds are much higher: $500,000 for single filers and $1 million for married filers. 1Pass through companies (i.e. unincorporated entities such as LLCs, partnerships and S corporations) are allowed under the Tax Cuts and Jobs Act to deduct 20% of “qualified business income” from their taxable income. At a 37% top federal tax rate, the 20% deduction approximates a 29.6% top marginal tax rate. Only domestic business income qualifies and deductibility is restricted for taxpayers earning above $315,000 for married filing jointly and $157,500 for individuals, to be indexed for inflation. Above these thresholds, the deduction cannot exceed the greater of 50% of W-2 wages paid or 25% of wages paid plus 2.5% of the unadjusted basis of tangible depreciable assets used in the business. Furthermore, this deduction is not allowed for “specified service businesses” including businesses in health, law, accounting, actuarial science, performing arts, consulting, athletics, financial services, brokerage services, businesses in which the principal asset is the reputation or skill of one or more of its employees or owners, and businesses involved in investing and trading in securities, partnership interests or commodities. Lastly, it’s important to note that multiple businesses are aggregated and the deduction is allowed against the total net qualified business income. This provision sunsets for tax years beginning in 2026. 2Please note that property tax deductions are capped only for personal residences. All expenses are still deductible for investment properties. 3The AMT is a highly complex, parallel tax system enacted in 1969 and revised in 1982 in order to ensure that even folks with many deductions paid some minimum level of tax. At the time, there were a small number of households who paid little to no income tax due to the many legal tax credits and deductions available then. The idea was to have the taxpayer do their taxes under both systems and pay the higher tax. The AMT is a 28% flat tax on your taxable income after adding back exemptions and other deductions. If your AMT tax is greater than your regular tax liability, you would have to pay the difference. The Standard Deduction has increased from $6,350 to $12,000 for single filers and from $12,700 to $24,000 for married filers. As a result, it’s projected that the number of Americans taking the standard deduction will increase from 70% to 85%. The Personal Exemption of $4,150 has been eliminated. Employment related moving expenses are now no longer deductible, except for active duty military personnel. 2States with high taxes have been experimenting with methods to avoid this limit on SALT deductions, primarily through converting SALT to payroll taxes or having taxpayers contribute to charitable trusts. Some accountants and lawyers we’ve spoken with speculate that having employers pay payroll taxes in lieu of employees having to pay SALT will indeed be legal. However, the issue seems to be execution. Every employer would need to convince their employees to take a paycheck decrease because their employer will be paying their SALT via payroll taxes. On the other hand, most accountants and lawyers we’ve spoken with doubt that having taxpayers contribute to state run charitable trusts in lieu of paying SALT will be allowed by the IRS. That’s because there’s technically no charitable donation if you get a 100% benefit from your donation in the form of lower SALT taxes. Tax Deduction vs Tax Credit: A tax deduction reduces your taxable income whereas a tax credit reduces your tax liability dollar for dollar. For example, a $24,000 tax deduction on a $100,000 income means your taxable income is reduced to $76,000. On the other hand, a $2,000 tax credit means the actual taxes you owe will be reduced by $2,000. So if you had a $20,000 income tax bill, your new tax bill will be $18,000. Unincorporated Business Tax (UBT) – certain professions such as real estate salespeople operating as sole proprietorships are exempt from UBT (however real estate brokerage companies are not). This is a 4% NYC tax on income in addition to NYC’s regular income tax. Although there are exemptions if you make below a certain amount (i.e. roughly $100,000), many high earning self-employed New Yorkers will get hit by this deadly, double NYC tax. We talk about the heavy tax burden local New Yorkers and especially self-employed New Yorkers face in our article on considerations to buying an apartment in NYC. Deduction for Qualified Business Income – this is one of the most complex additions to the Tax Cuts and Jobs Act of 2018 and you should speak with your accountant to determine whether you qualify. It is our understanding after speaking with various NYC accountants that all businesses actually qualify for the deduction as long as they are under the taxable income thresholds of $315,000 for married couples filing jointly, and $157,500 for those filing as single. However, specific service trades or businesses are subject to a complete phaseout at $415,000 for married couples filing jointly, and $207,500 for those filing single. This means service businesses subject to this phaseout will get the full benefit of the deduction if their income is below the lower threshold, but the benefit will completely go away once they hit the upper threshold. The amount of the benefit in between the thresholds is subject to a complex calculation and will be somewhere in between. Non service businesses are subject to limitations on the deduction once they breach the lower thresholds of $315,000 for married couples filing jointly, and $157,500 for those filing as single. Once the threshold is breached, the deduction for non service businesses cannot exceed the greater of a) 50% of W-2 wages paid or b) 25% of W-2 wages paid plus 2.5% of the unadjusted basis of tangible depreciable assets. Self-Employed Health Insurance Deduction – there has been no change to this beloved deduction. Self-employed New Yorkers can still fully deduct their health insurance premiums. Home Office Deduction – there has been no change in the new tax law for this deduction. You can qualify even if an office is made available to you, as long as you can show that you rarely go to the office and that your principal place of work is your home. A typical reason might be because there is not enough space or desks available at the office if you are a real estate agent classified as an independent contractor. Or perhaps your company really only has a mailbox at a co-working space, and therefore you truly do not have an office you can go to. The IRS understands that almost no New Yorkers have the luxury of an exclusive home office area, so use your best judgement as to the percentage of your apartment that you use to do work. For example, it may be understandable if your living room doubles as your home office if you have a small 1 bedroom apartment. Health Savings Account (HSA) – There have been no changes to this deduction. You can still can still contribute to a HSA if you have a qualified, high deductible insurance plan. A HSA operates much like a IRA, you can contribute pre-tax earnings and there is no penalty to withdraw your funds after age 59.5, though you do have to pay income tax when you withdraw just like a IRA. This is a great way to use pre-tax income to pay for out of pocket health costs until you hit your insurance plan’s annual deductible limit. Meals and Entertainment – under the old law, meals and entertainment with clients or prospects were 50% deductible; furthermore, business meals1 were 100% deductible. Under the new law, meals2 and entertainment3 with clients or prospects are no longer deductible, and business meals are only 50% deductible. 1Business meals are meals provided to employees on premises (i.e. working late, team meetings, holiday party etc.) or meals while traveling away from home. Business meals include meals served at required business meetings at your office or in a hotel or other meeting place. Business meals include meals served to employees who are required to work during regular breakfast, lunch or dinner hours. Business meals also include meals served to employees at cafeterias on-site. 2The IRS has yet to come out with a final ruling on whether meals with clients or prospects will still be deductible. Some accountants we’ve spoken with suggest assuming that 50% is still deductible, though other accountants think that this deduction will be fully eliminated. 3Deductions for client entertainment such as golf trips, skiing, tickets to sports games are no longer allowed. More Questions? 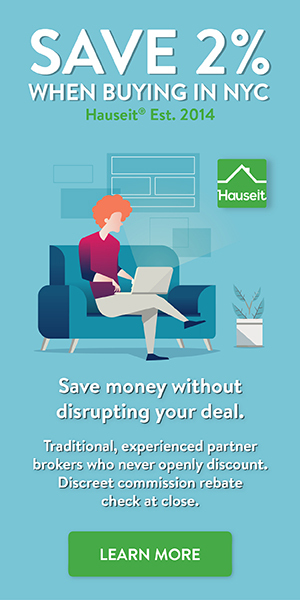 Ask us anything in the Hauseit Forum, where New York real estate professionals come together to discuss the toughest questions in real estate. Under the old rules, home owners could deduct the interest on up to $1,000,000 on their home mortgage, as well as up to $100,000 on a home equity loan. Don’t worry, if you purchased your home before December 14, 2017, your mortgage debt will automatically apply for the old rules. In fact, Congress has stated that new purchases that are in contract by January 1, 2018 and scheduled to close by April 1, 2018 will also be “grandfathered” into the old rules. Under the new rules, only the interest on initial mortgage debt up to $750,000 will be deductible against your taxable income. Furthermore, interest deductions on home equity loans, new or existing, are no longer allowed. Basically, home owners can no longer treat their homes as a “piggy bank” by taking out home equity lines of credit to buy whatever they want. 1Under the new tax code, mortgage debt incurred to fund a “substantial improvement” of the property counts as acquisition indebtedness. This seems to suggest that home equity lines of credit (HELOCs) are not simply dead according to the mainstream media. As of March 2018, the IRS has still been silent on this matter and has not come out with an official ruling or interpretation of this section of the new tax code. Note: the mortgage interest deduction only applies for personal residences, which means primary homes and qualified second homes. All expenses for investment properties continue to be deductible. Furthermore, as long as you can utilize the “tracing factor” and document use of proceeds, you can take out a home equity line to purchase an investment property, and have the interest be fully deductible against the new investment property. It’s important to understand that if you are buying a coop, the portion of the building’s underlying mortgage attributable to you will count towards the $750,000 mortgage interest deduction limit. For example, if your co-op corporation attributes $250,000 of the building’s mortgage to you based on your pro rata ownership of shares, then only $500,000 of your apartment purchase loan will be eligible for the mortgage interest deduction. You can find out your share of the co-operative corporation building’s mortgage principal attributable to you in the 1098 tax form that is mailed out yearly.